The lovely Sharon from Witchy Knits 4 Ewe is next up in the firing line, here is how we got on! "My Aunt was at my house one day making a blanket and after watching her for hours, I thought, “I can do that!” I asked her to show me and I was hooked from there! Then of course, all these Hollywood stars were getting into it and that made me even more interested in mastering it. So, I did!!" Is there any item you've sworn never to knit again? "Yes!! It was a beautiful entrelac shawl pattern that was written so horribly my friend and I frogged it at least 8 times. Finally, between the two of us, we figured out the pattern and rewrote it. It was a nightmare though and I swore I’d never make another!! I’m sure my knitting group is laughing reading this because they know what the pattern was and how much it frustrated me!!" Where is the weirdest place you've ever knitted? "I think I’d have to say at my friend’s college graduation. I’ve knit in Dr.’s offices and during my kids’ music lessons, but never in a giant stadium! That was definitely strange!" If there was anyone you could knit for, who would it be, and what would you knit? "I think it’s a tie between making something for Gwen’s new baby in Torchwood Miracle Day, or something for the stars of Dr. Who. Maybe a knitted bow tie for the Doctor and a new scarf and fingerless mitts for Amy…"
Which pattern are you proudest of, and why? "That would be my Cabled Fingerless Mitts. 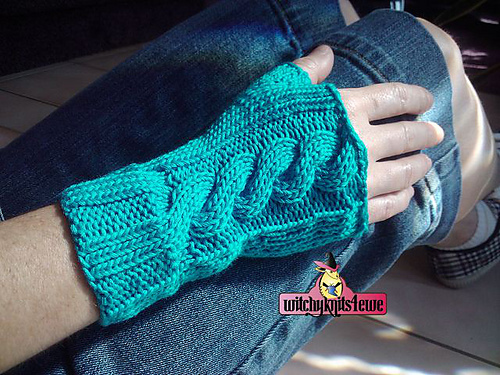 They are my most popular pattern and have been featured in The Daily Knitter & Crochter free pattern blog." We all have a weakness when it comes to buying materials, whether it be yarn, buttons or stitch markers, what is yours? "Definitely yarn!! I used to teach knitting at Michael’s Arts & Crafts and got a store discount and had a friend who worked for a major yarn company and gave me her discount. Needless to say, I have a ridiculous amount of stash!! I also like gadgets of any kind so I have a lot of things lying around that never get used but are “cool” to have!" "I’m in the middle of writing a book with my business partner for witchyknits4ewe, LLC and so trying to get my name out there and patterns for people to try has been a huge inspiration for me. I also love to write about my kids and all the cute animals I take care of all summer at the Day Camp I work for. So, my blog ends up being a little bit of this and that. Also since I found out I have Celiac and need to be Gluten Free, I’ve been blogging on that a bit too. I have my younger son on a GF diet and his Psoriasis has cleared up and his behavior has been better. He like to star in pics for my blog too!!" We all have a blog post we are particularly proud of, which is yours and why? "Wow, that’s a hard one!! I posted about a great day I had out with one of my good friends here and I was very proud of my husband and son when they made their igloo hereand I finished my vest for the Ravolympics… My Maryland Sheep and Wool post was fun too and then I used that for my first ABC Week post to your blog!! Like I said, WOW - I can’t decide on just one!!" How would you sum yourself up in 5 words? 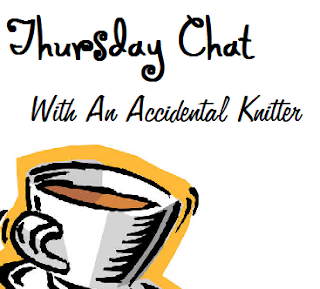 "I would say I’m a “witchy, wacky, gluten free knitter!” Does that work?! Haha!!!" Big thanks to Sharon for answering all my nosey questions, especially since she is a very busy girl. You can take a peek at all Sharon's patterns over at her Ravelry page, definitely worth a glimpse! Next week I'll be interviewing the lovely Contessa, so stay tuned!